Get Your Pumpkin Spice Fix in Downtown Franklin! Love it or hate it, there is no escaping pumpkin spice this time of year — and instead of running from the seasonal flavor favorite, we’re choosing to embrace it here in Downtown Franklin! From candles to coffee to even a burger (yep, you read that right- a BURGER! ), pumpkin spice comes in many different forms along #AmericasFavoriteMainStreet. The pumpkin spice latte. From the minute we even feel a slight chill in the air (meaning temperatures dip below 80 for the first time in months), people start lining up for this traditional autumn drink. These days it seems that everyone has their own twist on the fall staple, and that’s no different here in Downtown Franklin. Starbucks’ PSL is probably the most well known, but don’t forget to sample offerings from Frothy Monkey and The Coffee House at Second and Bridge (they reportedly use real pumpkin!) Report back and let us know which is your favorite! Is it even fall if you aren’t burning a pumpkin-scented candle in your home? We think not. We’ve scouted out some of our favorites that will give you all the warm, seasonal feels. 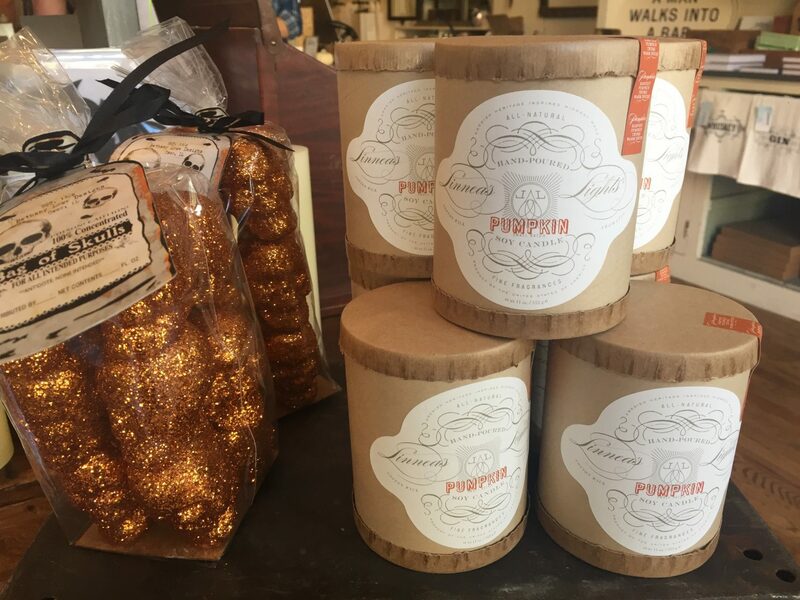 Grab a Linnea’s Lights Pumpkin candle at White’s Mercantile for a subtle fall smell that won’t leave you with a headache from pumpkin spice overload. NEST Fragrances’ Pumpkin Chai candle, available at The Iron Gate, is also a solid option, sure to create a cozy autumn ambience in your home. Just because temperatures are cooling off by no means signifies it it is time to stop eating ice cream. Thanks to Kilwin’s and Sweet Cece’s for giving us reason to indulge this time of year with their limited-edition pumpkin spice flavors. If ice cream just isn’t your thing (how?! ), no need to worry. There are plenty of other pumpkin spice alternatives to satisfy your sweet tooth. Our friends at Merridee’s have caught the pumpkin spice bug, and we are LOVING it. You really can’t go wrong with whatever you choose from all their pumpkin-y options, including–but not limited to– pumpkin bread, pumpkin pie rolls and pumpkin chess bars. IveyCake’s fall favorite “Charmed” cupcake is back, looking as festive and delicious as ever! This limited-edition flavor consists of a pumpkin spice cupcake topped with cream cheese icing and plenty of sparkles. Veering from the traditional pumpkin spice route, Puckett’s Gro. is really getting creative this year. Their burger of the month for October is the Pumpkin Spice Burger, featuring a classic burger, topped with crispy onion straws, lettuce, candied spice bacon and –wait for it–pumpkin cream cheese. This burger definitely has the potential to satisfy both the sweet and savory cravings of our festive fall appetites. We can’t wait to try it! But wait…Puckett’s didn’t just stop with the burger– their drink of the month also incorporates the star flavor of the season. The “Punkin Punch” features Corsair Old Punk, St. Elizabeth Allspice Dram, apple cider, lemon juice, cinnamon, clove and orange. Props to Puckett’s for their pumpkin spice spirit– we pumpkin spice lovers are thoroughly impressed! Although this pumpkin spice trend is all the rage, don’t neglect the classics. A pumpkin pie from Papa C Pies is an absolute must. Their rich and smooth pumpkin pie has just the right amount of spice! No matter what strikes your fancy or which version of pumpkin you prefer, we’re certain you’ll find it in Downtown Franklin. Be sure to capture your favorites to share on Facebook, Instagram and Twitter (and don’t forget to tag @dwtnfranklintn!). Happy Fall, y’all.